1334 Manningtree Air Cadets are recruiting now – ages 12 to 16 – for adventure, fun and to learn new life skills. Contact us using the form below. Air Cadets are a great organisation to join and offer fantastic opportunities. Despite being ‘Air’ Cadets we don’t just go flying, we practice target shooting with rifles, go gliding, mountain climbing, fieldcraft training exercises, camp building, visit active military stations, learn first aid and loads more. It doesn’t stop there…we also do stuff just for fun, such as go-kart racing and clayshooting… and there was that visit to see and climb aboard the AH-64 apache helicopter… and when we won that massive first-aid trophy… and that time we went up flying in the Chinook… in fact, there are so many opportunities available to you, there isn’t enough space here to list them all! There will be a few tests to do, such as understanding how to fly an aircraft so that we can let you take control in the air, but we’ll help you with all that. Team-up with your friends, make new ones and enjoy amazing experiences, as well as learn some new skills. Don’t miss out on these opportunities and all the activities available to you. Try us out for a while… if you don’t like it, we’re ok with that. You’ve got nothing to loose! We are open Mondays from 7pm to 9.30pm (as well as some other times depending on activity). Getting highly skilled in your favourite subject means that you could end up with a number of widely recognised BTEC qualifications that could really help you in a future career. A range of vocational qualifications are available through either ourselves or the CVQO. Thousands of Cadets pass these each year. So expand your horizons, have an adventure, learn some life skills, take the first step and get in touch. Categories: Flying, Formal Events, Manningtree Air Cadets, News, Social Events, Sports | Permalink. 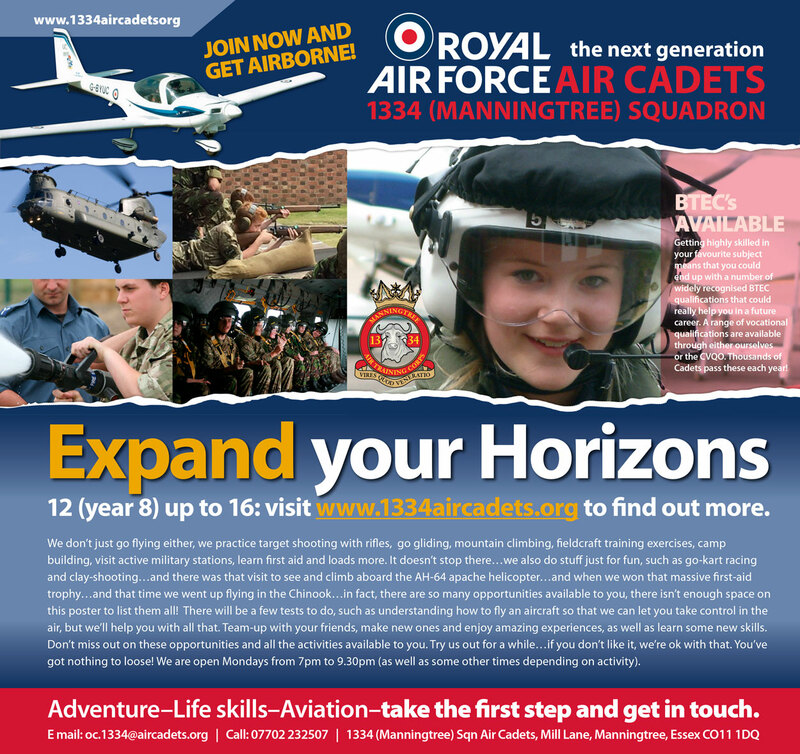 We are launching a campaign to recruit more members to 1334 Air Cadets and have created some new posters and graphics to spread the word. Please feel to download this graphic and share, share, share on your social media. 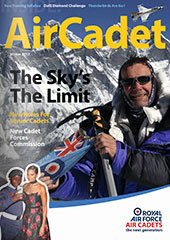 The Air Cadets are a great organisation to join and offer 12 to 16 year old’s fantastic opportunities. We don’t just go flying either, we practice target shooting with rifles, go gliding, mountain climbing, fieldcraft training exercises, camp building, visit active military stations, learn first aid and loads more. It doesn’t stop there…we also do stuff just for fun, such as go-kart racing and clayshooting…and there was that visit to see and climb aboard the AH-64 apache helicopter…and when we won that massive first-aid trophy…and that time we went up flying in the Chinook…in fact, there are so many opportunities available to you, there isn’t enough space here to list them all! There will be a few tests to do, such as understanding how to fly an aircraft so that we can let you take control in the air, but we’ll help you with all that. Team-up with your friends, make new ones and enjoy amazing experiences, as well as learn some new skills. Don’t miss out on these opportunities and all the activities available to you. Try us out for a while…if you don’t like it, we’re ok with that. You’ve got nothing to loose! We are open Mondays from 7pm to 9.30pm (as well as some other times depending on activity). Getting highly skilled in your favourite subject means that you could end up with a number of widely recognised BTEC qualifications that could really help you in a future career. A range of vocational qualifications are available through either ourselves or the CVQO. Thousands of Cadets pass these each year! During the second week of August some of our Cadets and staff attended the annual wing camp at RAF Benson near Oxford. It was a full and packed schedule all week with Cadets from several squadrons in the wing and although the accommodation was in tents the weather was mostly sunny and clear with the exception of brief heavy rain at the end of the week. The junior ranks mess was excellent, with a varied choice breakfasts and evening meals. A packed lunch was provided each day as we all needed to stay flexible. RAF Benson is a very active station and come Monday morning it was a hive of activity. Service personnel from not just the RAF were busy in their roles, there were also members of the Navy, Army, Police and even forces from other allied countries using the facilities that Benson has to offer. Among the many varied activities that Cadets participated in were; flying in the Westland Merlin HC Mk.3, AEF in the Grob Tutor, visits to see the Westland Puma of 33 Squadron. We also visited many of the active sections around the base such as; Air Traffic Control, the fire and engineering sections. There was also a mixture of sports, swimming, initiative exercises and drill to keep the cadets busy with very little free time in the evening left before roll-call and lights out. Not all activities were on-base, trips were organised to RAF Hendon Museum, Thorpe Park, Windsor Castle and a hilarious evening ‘ghost walk’ in the city of Oxford. Some of the cadets were also lucky enough to visit and fly in the flight simulators at RAF Benson. It is only one of four installations in the world with the capabilities to host multiple crews interacting together at the same time. With six fully functioning aircraft simulators at over 28 million GBP each, the installations are a serious piece of hardware. An end-of-week party rounded of the fun and several awards were made, including ‘most improved cadet’ to our own Cadet Woods. Congratulations and well done! Categories: Flying, Formal Events, Manningtree Air Cadets, News | Tags: RAF Benson | Permalink. Gliding in the Air Cadets is amazing and is open to all Cadets. Watch these brief videos and you’ll get some idea of what an experience it is…of course it is miles better in real life. If you are 13 years of age or more, you could be in the front seat, just contact us. Categories: Flying, Manningtree Air Cadets | Permalink. On 26th May, 3 Cadets went for glider traing and experience at 614 Volunteer Gliding School in Essex. The weather was absolutely fantastic and all the cadets were soon riding the thermals. One of our cadets was extremely lucky in having a very succesful 1 hour and 50 minute flight. There were 6 aircraft servicable and active throughout the day, shared between other Squadrons present and several cadets completing there Glider Training Course and preparing for their solo flights. One of the many activities 1334 Maniingtree Air Cadets run is Round the Pole Flying or RTP for short. The Cadets get involved in the design, model making and flying of model aircraft. 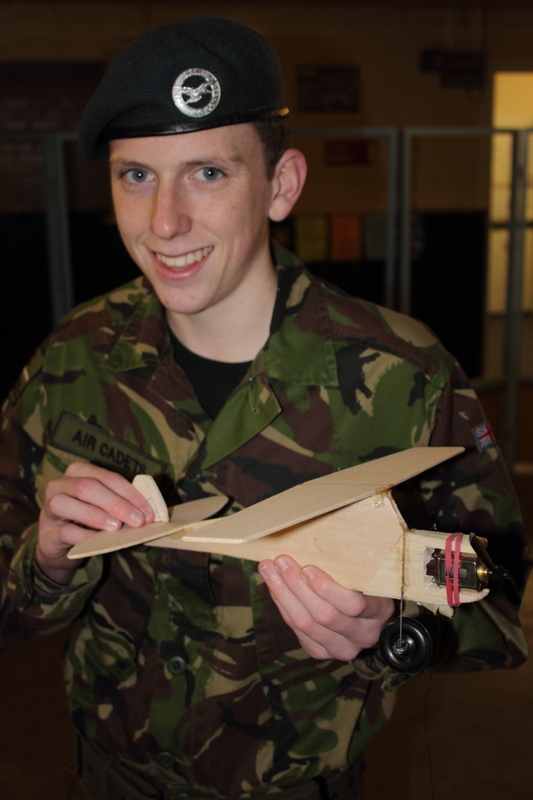 Cadet Fletcher recently completed his model which flew perfectly on its first flight. On Sunday 11th December, 7 members of Manningtree’s Air Cadets visited the RAF Museum at Hendon for part of their 1st Class Training Programme. Here are a selection of photos from the visit, with a full report by the Cadets themselves to follow soon. Categories: Flying, Manningtree Air Cadets, Social Events | Permalink. 16 Cadets from Manningtree Air Cadets visited Duxford on Saturday 5th March, needless to say we had a good day with plenty to do and see. We’ll leave the pictures below to tell the story. Please leave any comments below. Here are some recent pictures from Manningtree Air Cadets AEF from RAF Wyton. If you are 13+ then you could experience the thrill of flying and even take the controls under instruction from the pilot. Contact us today and see how you can join.